Our last plumeria picture received so much response that we thought you may enjoy another close up shot of one of Hawaii’s most pleasant-smelling and beautifully delicate flowers. 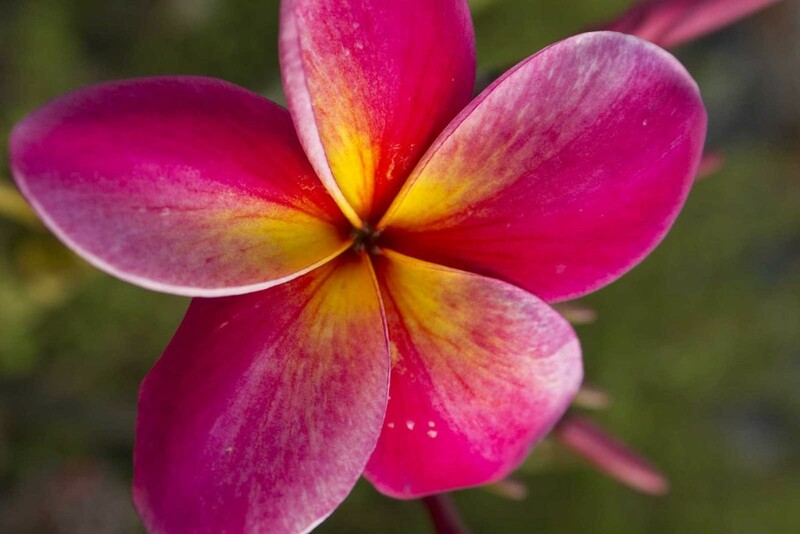 There are 8 species of plumeria (Frangipani) in all with more than 300 varieties ranging in color from primarily white to, like this one, purplish hues. The plant plumeria grow on also ranges from small shrubs to medium-size trees. Plumeria trees are seen throughout Hawaii and if you’re lucky enough you may even come across fields of plumeria nurseries. Plumeria have a strong smell all the time, but smell most strongly in the evening as they try to attract pollinators. Their common name comes from a Italian marquess who used the flower in a plumeria-scented perfume.